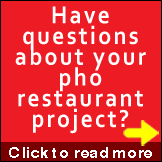 Pho 24 is an up and rising noodle restaurant chain serving exquisite pho rice noodle dishes. Pho 24 now has store locations in Cambodia, Indonesia, the Philippines, and Sydney, aside from its many locations within Vietnam. Pho 24 is part of the Nam An Group, a corporation that specializes in serving Vietnamese food through several restaurant chains the world over. 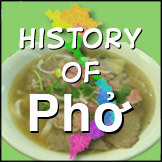 The group is known for its unique pho recipe, which is the secret behind Pho 24's success. According to Pho 24, its pho is a carefully mastered art; the founders of Pho 24 ensure that the famous noodle dish is done just the way it's supposed to be. Pho 24 also focuses on the nutritional aspect of the meal, making sure that a pho dish from Pho 24 has all the important qualities to make a well-balanced noodle dish. But this does not mean that the dish is only healthy; pho is served deliciously at Pho 24, with the soup carefully blended with the choicest ingredients and the most enticing mix of spices. What sets Pho 24 apart from other pho noodle chains, however, is its attention to the dining environment. Pho 24 maintains small, clean, and cozy stores with great decorations in an East Asian theme and an appetizing ambience, a far cry from the street stalls where pho used to be served. This means Pho 24's clientele can enjoy pho in air-conditioned, comfortable, clean and safe dining rooms with good service; amenities that many people in Vietnam and other Asian countries consider a luxury. Don't get me wrong: I'd eat at a side street stall any day, but I think variety is also good for both vendors and consumers. Pho 24 also has a steady promotional program, the name itself describing what the store offers. The number 24 is meaningful for Pho 24. Let's take a look. First of all, Pho 24 locations open 24 hours. Next, 24000 in Vietnamese dollars is the common price for a bowl of pho ga (chicken pho) or pho bo (beef-pho) served at the restaurant. At the current exchange rate of VN$17785 (VN đồng) to US$1.00 (mid-May 2009 rate), this works out to be about US$1.35 for a bowl of pho! 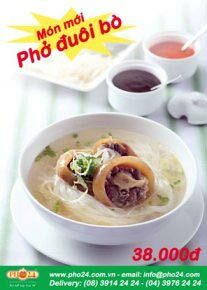 Other pho dishes have crept up into the high 30000 to mid-40000 đồng. which is diligently stewed for 24 hours before it is served. 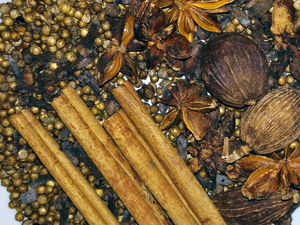 The 24 ingredients plus the thorough preparation process ensures that the pho broth at Pho 24 has a rich and sumptuous flavor, according to the company. 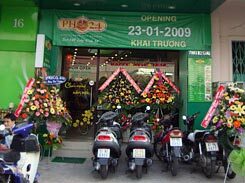 The first Pho 24 store opened in Saigon back in 2003, and this was quickly followed by other locations in the different Saigon districts, and in Hanoi. The first overseas jump was established in Jakarta, Indonesia, marking the beginning of Pho 24's international growth. Currently, Pho 24's franchise locations, counted at 70 locations, are not the largest in terms of the number of countries, but the restaurant chain has envisioned itself as an international pho brand name, and it is working steadily towards this goal. To speed up the process, Pho 24 provides small stores and requires low investments to make the franchising opportunity possible for anyone interested. Pho 24 also makes it easy for franchisees, offering a standardized operating and management procedure as well as guidance in store selection, design, staff training, and an ongoing marketing support. 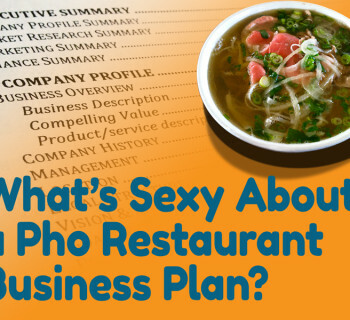 If you are interested in franchising, and specifically pho, Pho 24 may be a good program to check out. Named as one of the Top Restaurants in Asia and featured in The Miele Guide, Pho 24 is definitely the perfect place to get acquainted to or to enjoy both classic and unique pho dishes. For now no U.S. location exists, so if you happen to be in Vietnam, don't forget to check out a Pho 24 store. And if you had eaten there, please share your experience with us. Do you offer franchise in Calgary, Alberta, Canada yet? Coz Im interested to have one. @Randy: If you’re interested in building your own pho restaurant or pho franchise, then I can help you do that. 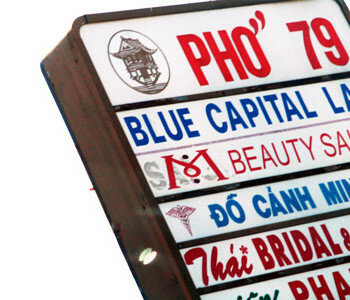 But if you want to open a Pho 24 franchise unit, then you should contact Pho 24 directly. 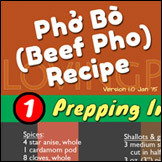 I do not offer Pho 24 franchise on Lovingpho.com. Best of luck!